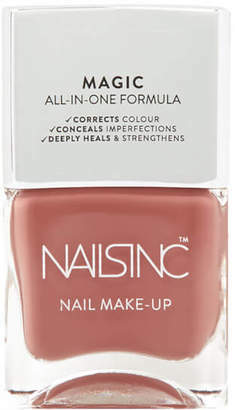 Treat your nails to the multi-purpose benefits of nails inc. Nail Makeup Nail Polish in ' Beaumont Street ', an all-in-one formula that works to conceal imperfections while strengthening and repairing. In a neutral colour, the miracle nail varnish glides effortlessly on, expertly correcting the appearance of ridges and imperfections while hardening soft, brittle nails. Formulated with clinically tested Hexanal and a cocktail of fruit and flower oils to promote deep, long-lasting repair. The colour is perfected for a range of skin tones, and its fortifying properties leaves nails looking transformed.